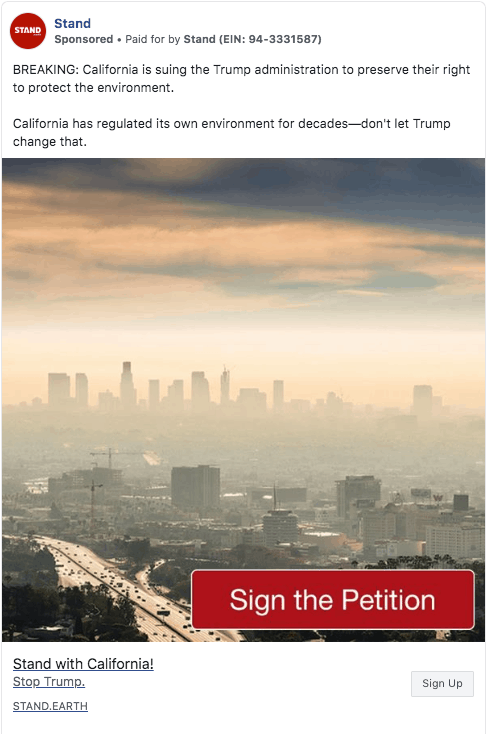 Stand, a 501(c)(3) environmental organization, recently had an exciting breakthrough in their work to build their email list using Facebook ads. Many organizations pay $1.50 to purchase emails or $1.00 or more for new subscribers via Facebook ads. By refining their audience and testing several ads, Stand has been able to bring that down significantly to $.64 and continues to bring this cost down even further. The Progressive Multiplier Fund is honored to be supporting Stand’s work through a recoverable grant to generate revenue for its campaigns. Stand advocates for a cleaner environment and does so by “challenging corporations and government to treat people and the environment with respect.” Their work over the last twenty years has had great impact, ranging from changing the environmental practices of huge corporations, to protecting rain forests and forests around the world. Stand’s recoverable grant focuses on recruiting people to join their email list via Facebook ads and subsequently raising funds from those subscribers via email. They achieved a major breakthrough by reviewing existing email list subscribers who take three or more actions, and loading them into Facebook. They then can find people who behave similarly in Facebook and advertise to those people. They have found that these acquired subscribers mirror the same engagement metrics of their original audience in terms of online activism. 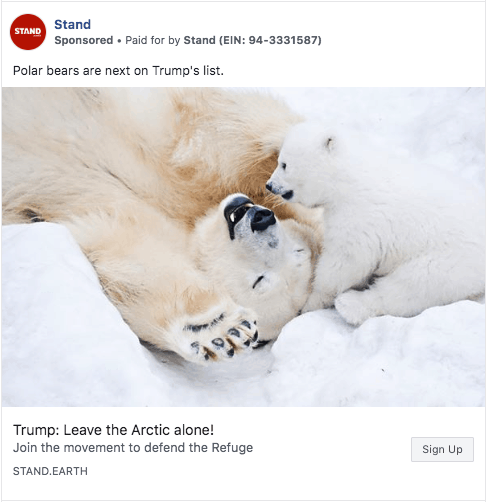 As more of these subscribers and target audience donate, Stand leverages Facebook’s machine learning capabilities to refine its look-alike model to advertise to people who are even more likely to donate. While refining their target audience matters, the message and ad content matter just as much. Below are three of the top performing ads that they have used so far in their campaign. The Progressive Multiplier Fund has funds for eight non-profits to test FreeWill or similar planned giving tools. Non-profits should have a responsive email list of 100,000 or more, and should have been in existence for around ten years or more. To Apply, please reach out to FreeWill directly to learn more and get a quote. Then you can click “Projects” in the Center of Excellence and then click “New” to create a Recoverable Grant application, and include your email list size. Feel free to use content from People’s Action’s grant application to keep it simple. ** Note — all links point to the Center of Excellence. If you don’t have access, apply here. 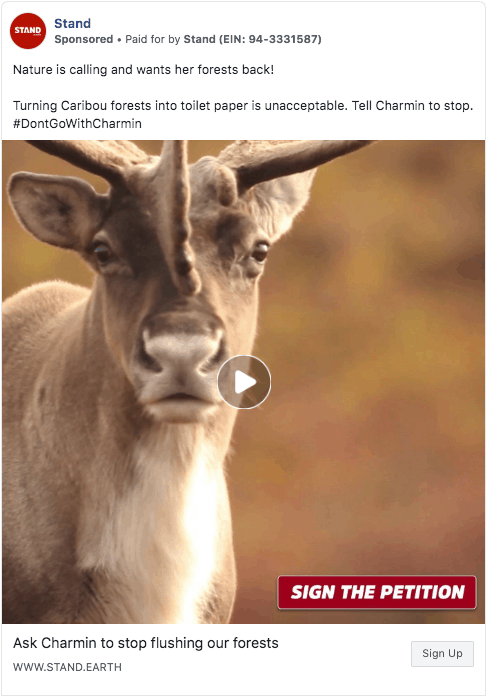 Organizations are increasingly using Facebook ads to target audiences that look like their donors or members (sample grants for this here). In general, organizations applying to the PMF have tested and refined their look alike models to generate a lead (someone who opts in to their email list or to being called) for about $.70 per lead. This is an excellent way for organizations of all size to scale up quickly. If you have not mastered this technique yet, a good first step would be to apply for a small grant ($5,000 or less) to build and test a look alike model for fundraising purposes. You can enter 1,300+ donors’ email addresses into Facebook to build a model, or rent direct mail lists from organizations that are similar to yours to get the sample size that you need. 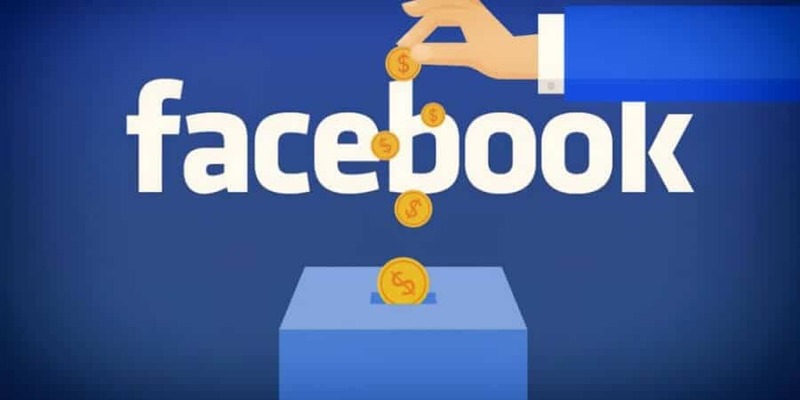 Peer to Peer Fundraising — Some organizations are using Facebook ads to recruit people to host peer-to-peer fundraisers for their organization on Facebook. Sending fundraising appeals during times of crisis to support multiple local organizations. If your organization (or consultant) does not have a track record of running Facebook ads and generating leads or subscriptions for under $1, then you are welcome to apply for a mini-grant (i.e. $5,000 or less) to run a series of tests to reduce your lead generation cost. If you do have a track record in generating inexpensive leads via Facebook, but do not yet have a proven track record in generating $2 for every $1 invested over time via emailing or phoning these leads, please consider applying for a grant to test the follow-up fundraising techniques. Finally, if you have proven that your organization and team (including staff and consultants) can do both of the above, please consider applying for a recoverable grant with the Progressive Multiplier Fund. Take a look at past grants and the key performance indicators that are tracked to measure success (and learn as we go) when drafting your grants. The Program Director of the Progressive Multiplier Fund is the perfect position for a fundraising specialist who would find meaning in making a broader, movement-wide impact; enjoys exposure to the most cutting edge ideas; and thrives in a data-driven decision-making environment. They will be joining a rapidly growing start up organization and part of a four person senior team that is thinking and acting dynamically. The Program Director leads the Progressive Multiplier Fund’s (PMF) grant selection process, tracks and publicizes best practices in non-profit revenue generation, manages marketing efforts for the PMF, and manages relationships with grantees. The best candidate for this position will possess excellent analytical skills, have experience creating and assessing small donor and fee for service financial models, be an enthusiastic convener of best practice and respectful in communication with grantees, and act as a strategic partner with the senior team in designing the overall grantmaking strategy of the PMF. They will be capable of moving seamlessly from high level strategic planning to detailed analysis of business models and motivated by working on a wide range of progressive causes. The PMF is a non-profit organization that finances small donor and fee for service projects for the progressive movement. Stay up-to-date on best practices for targeted fundraising channels. Represent the Progressive Multiplier Fund at major fundraising, donor, and non-profit conferences. Participate in the design and execution of small donor fundraising projects for the Progressive Multiplier Fund in future years. Experience in grantmaking a plus. Prospective candidates interested in applying should contact our search partners Perrett Laver. For an informal discussion about the role, contact Daniel Flynn (Daniel.flynn@perrettlaver.com) to hear more or address any questions you may have. Completed applications comprised of CV and cover letter should be uploaded at http://www.perrettlaver.com/candidates quoting reference number 3638 or sent to Daniel Flynn directly at Daniel.Flynn@perrettlaver.com. The deadline for applications will be Friday, May 10th, 2019. Protecting your personal data is of the upmost importance to Perrett Laver and we take this responsibility very seriously. Any information obtained by our trading divisions is held and processed in accordance with the relevant data protection legislation. The data you provide us with is securely stored on our computerised database and transferred to our clients for the purposes of presenting you as a candidate and/or considering your suitability for a role you have registered interest in. Perrett Laver is a Data Controller and a Data Processor, as defined under the General Data Protection Regulation (GDPR). Our legal basis for much of our data processing activity is ‘Legitimate Interests’. You have the right to object to us processing your data in this way. For more information about this, your rights, and our approach to Data Protection and Privacy, please visit our website http://www.perrettlaver.com/information/privacy-policy/. Most progressive organizations can dramatically increase unrestricted, sustainable revenue through disciplined financing and information sharing according to a recent study on fundraising innovation. In 2016, a group of fundraising innovation thought leaders conducted a six month study that unearthed a critical mass of progressive organizations that are ready to launch small donor and fee for service tests, and to roll-­out proven programs, but cannot find the needed financing. Of the 35 organizations interviewed for the study, each organization was testing an average of two scalable revenue projects. These project were primarily focused on small donor fundraising, fee for service, and certification programs. Half of the organizations surveyed could raise $500,000 more annually from proven models if they had the funding to invest. Widespread Fundraising Innovation, particularly among smaller organizations. Smaller progressive organizations are doing a higher volume of innovative experiments, which could benefit significantly from increased funding. While some of these non-profits lack the capacity to scale, there is no shortage of consultant and intermediary support organizations to complement non-profits’ existing capacities. Proven Scalable Revenue Programs. A critical mass of larger progressive organizations have developed scalable fundraising models that, if expanded, could raise significantly more revenue. Unfortunately, the organizations lack the financing to expand these initiatives. Experimentation and Innovation. A small number of foundations provide limited grants to progressive groups to conduct scalable revenue experimentation. Unfortunately, this form of financing is neither readily available, nor abundant enough, to optimize scalable revenue testing. Strikingly, the study found that smaller social, economic, and racial justice organizations conducted a higher volume of innovative experiments that could benefit significantly from increased funding. Best Practice Sharing can Accelerate Learning and the Scaling of the Progressive Movement. While organizations share some best practices, there is no progressive-wide hub where results and techniques from rigorous tests are widely shared. Indeed, because the field is changing rapidly, even general best practices around grassroots fundraising are not easy to find for organizations with limited experience. Create a Test and Innovation Fund to turbocharge experimentation and knowledge dissemination. An essential component of scaling progressive groups is to fund experimentation and prototyping. When such experiments succeed or fail, the next step is to share that information across the progressive movement. Small donor fundraising needs constant innovation as older methods (e.g. on-line, direct mail) lose steam. The Test and Innovation Fund will incentivize progressive groups to experiment more creatively. The fund will ensure that a diverse range of progressive organizations are able to participate. Create a Center of Excellence on Scalable Revenue. Our findings support the need for a Center of Excellence (CoE). The CoE will share best practices in small donor, fee for service, or sales efforts across the progressive movement.